This was probably the most epic day of my life! A day of highs and lows. I got a call from the Skydiving company and was told that my Skydiving session has got to be postponed to the afternoon. Initially, I booked the session at 8:30am because I had a train to catch in the afternoon at about 2pm. Now someone will come and pick me up at 12:30pm and I'll do the sky dive at 1pm. Then one of their staff will drive me to the train station. Talk about mad rush! Interlaken is the outdoor capital of Switzerland. (At least according to me.) Because in Interlaken, you can find almost any outdoor adventure activities that you want. If you can name it, you can find it there. You can go skydiving, bungee jumping, canyoning, hand gliding, paragliding, caving, rock climbing, whitewater rafting, skiing, among many other activities. Oh, I went there when the Jungfrau Marathon was going on. That is one of the best known mountain marathons in the world! Of course, I didn't go to Interlaken to take part in that! I didn't even know about the Marathon until I was there. This is a small city which can be covered easily by foot. 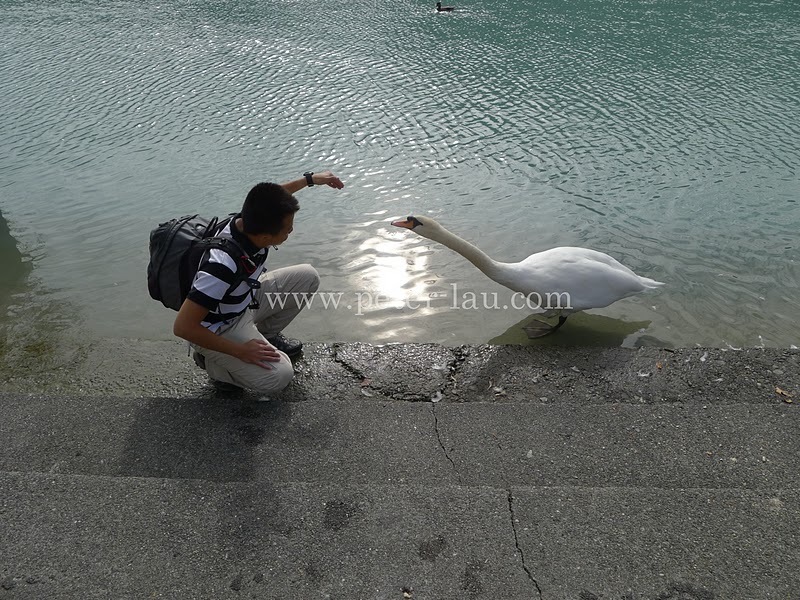 Played with a swan along River Aare. The reason I chose Interlaken to do skydiving was because it is ranked the top destination in the world for skydiving in many websites. If it is not the top, it will be somewhere in the top 3 places to skydive. When I was there, I could easily see why. Got all my bags and hopped into the pick-up car that brought me to the airfield. Traffic was bad because of the Jungfrau Marathon. After I was geared up, I went into the small jet that brought me up into the skies. Then I leaped off the jet with my instructor!!! Was I scared? Not really. I have no time to be sacred. Everything happened so fast and I just followed the instructions and suddenly I was spinning a few rounds during free fall. Before the jump, I even told the instructor to do the craziest thing he has ever done to scare the hell out of me. Maybe I shouldn't. The instructor did all kinds of crazy flips and turns and it was thrilling!!! I've no regrets. This is, without a doubt, THE BEST experience in this trip. The view from above was gorgeous! As I was coming down with the parachute, I could see a few cities and so much of the Swiss Alps!!! It was awesome. I think my mouth was open the whole time. Wow!!! I definitely skydive again at a different place! Immediately after the skydive, I went to make the payment for the video that they recorded and there was already a car outside waiting for me. Rushed to a train station and managed to catch the train just in the nick of time. I had a transit in Bern and wanted to walk around the city. But I only had 50mins before my next train departs. I went to the Luggage lockers at the train station but I do not have enough Swiss Francs to pay for the locker! So I had to carry my HUGE Haversack around. Next, as I was still wearing thermal pants (because Interlaken was quite cold, not to mention skydiving), I need to change out of it because my legs were getting hot! But I have to pay to use the toilet! And I did not have enough Swiss Francs to pay for the toilet! I went to the tourist information center at the train station and asked if I could go behind their counter to change my pants but they wouldn't allow. I told them I have no local currency to use the toilet but they wouldn't bulge. I was running out of time to explore Bern. After much persuasion, one staff told me that I could just change there in the tourist center and he will stand in front of me to cover me. So I took out my PANTS in the middle of the Tourist Information Center! It was not as if the staff was able to cover me with his body anyway. There was a lady in the Center at that time too! Not sure if she noticed. This is one experience that I will NEVER, EEEEEEE........EEVER, forget. I quickly left the Tourist Information Center and walked around Bern. Saw Albert Einstein's House. He lived there from 1903 - 1905. I heard that Black Forrest Cake (or anything Chocolate) is really good in Switzerland. So I made a last minute dash into one of Bern's bakeries and bought 2 types of chocolate cake. The counter staff couldn't speak much English so I got 2 cakes just to be safe. I didn't know what they were. Fortunately, they accept Euros in this shop so I could pay using Euros!!! Got the cakes and ran back to the train station with my HUGE Haversack. 12.30am (Midnight). Arrived in Cannes at an unearthly hour. Earlier in the train, I called up the hotel, where I was staying, and asked if I could go to the hotel lobby at about 1:30am and wait till the next morning for check-in. The hotel staff said no. He couldn't allow anybody to stay overnight at the lobby. He wouldn't bulge. And I didn't want to pay for an extra night because it was only 5-6 hours to the next day morning. The hotel is quite far from the train station in Cannes. In order to get there, I had to take a bus. But the at 12:30am, most of the bus services had stopped. In any case, I won't be going to my hotel first because I don't know the area well and I didn't want to be stuck overnight at an unknown place. I thought that I could at least spent the night at the Cannes Train Station but it was closed immediately after my train left the station. So I walked out and stayed at the bus stop just outside the train station. It was past midnight and it was dark. I didn't want to go anywhere further. Remember that I was carrying my HUGE haversack. I put my HUGE haversack down and sat on the small bench at the bus stop. I couldn't really sleep because I was afraid that someone would come and steal my things or disturb me. So I closed my eyes, opened my eyes, closed my eyes, open my eyes......and it continued like that for a while. There were still some people on the streets walking around, some drunk, some not so drunk. It was cold by the way. And I was shivering at the bus stop. One of the most humbling experiences in my life. At about 3:30am, there was this lady who came by the bus stop and waited for the train station to be opened. I have no idea why she was there in the wee hours in the morning to wait for the train station to be opened. She could have come a bit later right? Anyway, I think she was God-sent. Because she was really nice and entertaining. She was talking to me about music and where I come from and other random stuff. Then she began to sing!!! Haha.... At 4am in the morning, that was the last thing I wanted to hear. But after a while, I really enjoyed her singing and her company. She was really entertaining. She even danced while singing! I just kept laughing and nodded my head in sync with her tunes. And when she was singing, she would nudge me and asked me if I know this song, and asked me to sing along! Haha..... I tried and I think I failed miserably in comparison to her. It was just funny. She sang many songs, including songs from Micheal Jackson! Tried to catch a few winks when she walked away. But after a while, she came back! She couldn't stop singing and dancing at the bus stop. It was really comical. At 6am, the train station opened. And we said goodbye and she left. I went to the train station to settle my subsequent train rides. I was still recovering from the cold at the bus stop and was really really tired. I was a zombie walking around the train station. I got on the pubic bus and went to the hotel and checked in. Fortunately, the hotel allowed me to check in early and I went to sleep at 7am in the morning. What an epic day (& night)! Thank God for sending an angel in the middle of the night to accompany and entertain me! After Skydiving (in Interlaken), changing pants at a Tourist Center (in Bern), and spending a night at a Bus Stop (in Cannes), MY LIFE WAS DEFINITELY NEVER, EEEEEEEEEEEEEEEE....................................EEEE...........................EEVER, THE SAME, AGAIN!! !